Archibald was about 6 years older than draper James, and his father was also a James Beatty. Could they be brothers? I even lashed out $40 to get Archibald’s marriage details as that would give the profession of his father. Now you’d think that someone who was a “merchant” by age 22 was probably the son of a merchant right? Well no. His father James Beatty was a farmer! Another coincidence? According to this news article he had a nephew Joseph Beatty. Joseph is another name that has occurred in our family – Alfred Joseph was the youngest son of James the draper. I think this is too many coincidences. I’m going to track down Joseph now, in case he eventually leads back to the mysterious farmer James. A few leads have emerged which I haven’t got around to documenting here yet but I’m too impatient to keep on waiting to get information out of Ireland page by painful page when I can see how much of it is right there in the National Archives and National Library in Dublin. Good grief I could spend the equivalent of the airfare in dribs and drabs before getting noticeably further so why not just go? Good excuse eh? I booked the flights this morning. 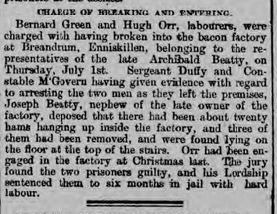 As there’s no James Beatty leasing in Arran street where his children were born, and his business is in Knox street, it’s quite likely that the family lived at 5 Arran street with Archibald. Living with extended family was quite common back then. Was Archibald James’s uncle or his brother perhaps? My other lead is about the Pagets. One source I’ve seen recently has Kinard being originally purchased in 1810 by “James Paget of Knockglass”. Our James Paget was only 7 in 1810, so who is this James Paget? His father? His Uncle? 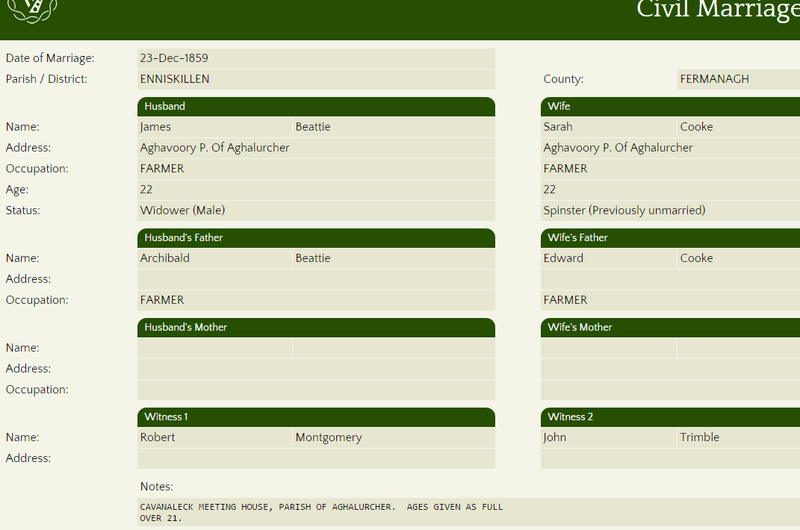 I think at least it does prove that our Pagets are the same family as the Pagets of Knockglass, Crossmolina. Remember the Beatty brother and three sisters who lived at Enniscrone, County Sligo, the last of them dying only 3 years before Peg Beatty went looking for our forebears there in 1953? Someone posted here who is definitely related to them, and to most of the other Beattys of Mayo and Sligo of the late 19th century and we’re exchanging information. Whether we are all related to each other or not remains to be established, but the more researchers trying to sort out the Beattys the better. Thanks for your help new contact!